The opening credits sequence, set to the Wu-Tang Clan classic “Shame on a N****,” features lots of cool kung fun action and holds some promise that RZA managed to pull together something entertaining for his film debut. Unfortunately, it’s downhill from there. 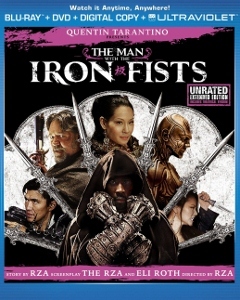 The Man with the Iron Fists turns out to be one big, noisy missed opportunity, drenched in computer-generated blood. Though his music career speaks for itself, RZA isn’t a filmmaker. Writing, directing, and starring in a $15 million feature film was biting off too much, to say the least. In all fairness to Yune, who acquits himself quite nicely in the role of Zen-Yi (aka The X-Blade), he hadn’t yet seen the final cut and was only relaying what he’d heard from those who had. Somewhere along the line, Fists got bungled very badly. The story, which concerns Zen-Yi avenging the murder of his father, is not only hard to follow, it’s impossible to care about. 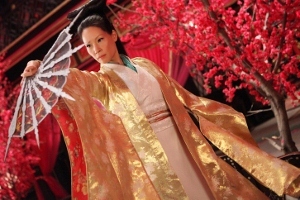 During the 19th century, two warring clans in China’s fictional Jungle Village fight it out with weapons supplied by the town blacksmith (RZA). Zen-Yi’s father was the leader of one of the clans. Jack Knife (Crowe) joins in, as does the blacksmith after he gets dragged into the conflict. All the blacksmith wants is to get out of Jungle Village with his girlfriend, Lady Silk (Jamie Chung). Crowe has some fun with his role, slipping effortlessly between soft-spoken gentleman (well, maybe not gentle, but mannered at least) and raging warrior. His gun-sword is a pretty cool weapon, which he uses to utterly eviscerate his foes. He also has a good time at the Pink Blossom, a brothel owned by Madam Blossom (Liu), though in this regard the movie remains squarely (and peculiarly) in PG-13 territory. Liu makes little impression but that’s because she’s given nothing interesting to do. 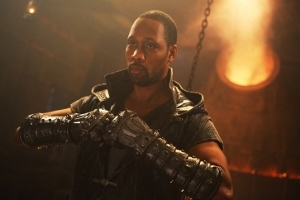 On the other hand, RZA makes even less of an impression. He seems so intent on underplaying, he nearly evaporates from the screen. It’s literally hard to even pay attention to him even while he’s onscreen—I can barely even recall him speaking. It’s indulgent enough that he felt the need to be a writer-director, but casting himself in such a prominent role turns this into a vanity project. Yes, there’s a lot of a wildly over-the-top martial arts action (choreographed by the legendary Corey Yuen). The problem is, even that becomes tiring very quickly since the fight scenes aren’t hung on a coherent story. There’s no shortage of “plot,” but the scenes don’t flow together, making the hour and 48 minute unrated cut feel far longer. The Blu-ray looks good, with the digital cinematography looking extremely sharp and detailed in the 1080p, AVC-encoded transfer. The clarity, in fact, only draws attention to the subpar digital effects work. There’s a shoot during the opening credits involving a dog attack that doesn’t even look finished. But whatever shortcomings are inherent in the effects don’t change the excellence of the transfer itself. The DTS-HD MA 5.1 mix features super-prominent LFE activity (maybe a tad too much subwoofer rumbling, truth be told). Dialogue is well-balanced with the barrage of surround effects and music. In addition to the 12-minute-longer unrated cut, supplemental features include an additional 20+ minutes of deleted/extended scenes and a handful of mercifully brief EPK featurettes. Given the cast and RZA’s well-known regard for the martial arts movie genre, not to mention the involvement of Eli Roth and Quentin Tarantino, I wouldn’t blame anyone for having their interest piqued. Mine was. I felt incredible depressed by the missed opportunities. Go into The Man with the Iron Fists with the lowest of expectations.